Lyndon McLellan owns the L&M Convenience Mart in rural North Carolina. A few months ago, the Internal Revenue Service went to McLellan's bank and seized all the cash in his store's account. McLellan had violated a "structuring" law by making cash deposits of under $10,000. Structuring laws are supposed to catch drug traffickers and money launderers. But small business owners can also unknowingly run afoul of these laws. Last July, a swarm of officers from North Carolina's Alcohol and Law Enforcement, the local police and the FBI descended on McLellan's place of business. The agents told the small business owner something that shook him to his core: The Internal Revenue Service had seized all of the money in L&M's bank account: $107,702.66. "'Are you telling me you took my money?'" McLellan recalled asking the agents. "I didn't understand what was going on. They dropped a bomb on me. I was lost for five to 10 minutes. I can't believe that y'all guys can walk in here and tell me y'all took every bit of my money out of the bank." McLellan is still fighting to get his money back. "In 2005, the Internal Revenue Service made just 114 structuring seizures. By 2012, that number had risen to 639." This story shows how the government can financially upend the lives of citizens. ... I have long advocated holding outright cash notes, which are already preserving value better than commodities and negative-interest-rate bonds. But we cannot depend upon government to act fairly. If in a future panic central banks opt to recall cash, even cash-holders will be doomed. All authorities need do is demand that people turn in their cash for new notes worth 1/10 as much. In 1933, the U.S. government confiscated gold because that was the money of the day. Now, dollar deposits and cash notes are the money of the day, and they are even easier to seize. 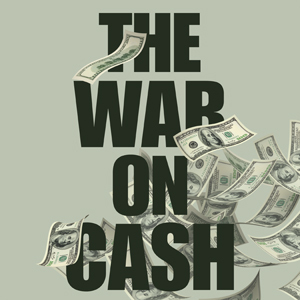 We've been updating subscribers on the "War on Cash." Giant financial institutions and the government are now waging a large-scale war on cash. This is the time to get the financial insights you need to protect your hard-earned savings. Big government is conspiring with big banks to wage a secret war on cash by limiting and even outlawing the use of physical currency. This development may have a devastating impact on your hard-earned savings unless you prepare right now. This article was syndicated by Elliott Wave International and was originally published under the headline Why the IRS Seized All the Money from a Country Store. EWI is the world's largest market forecasting firm. Its staff of full-time analysts led by Chartered Market Technician Robert Prechter provides 24-hour-a-day market analysis to institutional and private investors around the world.